Rendezvous for the team of 6 was Bowlees car park on a typical November morning - grey with some rain forecast. Busy it was not. Walking down to the Tees we spotted a large group of paddlers from Leeds University having an exciting time going over Low Force, with not a capsize or even a roll. We then had to cross the Tees using the quaint wynch bridge. Dating from 1830, the current bridge was a replacement for one which collapsed in 1802 that gave lead miners from Holwick access over the river to work in lead mines on the north side of Teesdale. The bridge was closed for essential repairs over the summer of 2018 and new steel hangers were fitted. We gave them a good test in ignoring the plea to step on the bridge one at a time. Heading upstream now on the south bank and into the area where the largest stand of Juniper in the UK is being devastated by disease. Phytophthora austrocedri is a fungus-like pathogen first reported in the UK in 2011, and infected trees have since been found at sites across Scotland and the north of England. It primarily attacks juniper roots, killing phloem and forming lesions which extend up into the lower stem. Eventually the tree will be killed by girdling of the main stem. Boot washing stations are in place to try to arrest the spread with information provided by a hand cranked recorder. But being on the Pennine Way and with rabbits and sheep around, it is difficult to be optimistic, and evidence of dying trees is widespread. 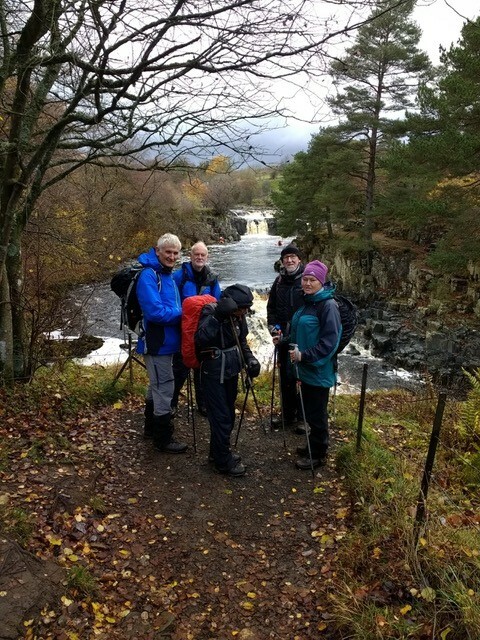 At 11 am we could stop at the viewpoint overlooking High Force for two minutes of silence and reflection. Onwards past the huge site quarrying whin sill which gives the area such distinctive topography. And then past Bleabeck Force before turning south for the ascent to Birk Rigg. We were greeted with views west up the dale as we found shelter for a hasty lunch stop, with rain to dampen the sandwiches but not the spirits. The stream crossings which were almost insignificant throughout the year to date, were challenging but manageable. Teamwork triumphed every time. Easy going along the shooting track back to Holwick, and through the gate with the most fantastical carved stone sheep. Then down hill back to the Wynch Bridge. Highlights exhibition entitled Craft+Conflict which takes the theme of conflict, not only marking the 100th anniversary of the end of WW1 but also exploring ideas of rural conflicts, refugees from war and even family conflicts. Bringing together artists from Syria, Sweden, Sri Lanka and the UK (including three from Highlights’ home county of Cumbria), Craft+Conflict includes an exciting variety of media including ceramics, enamel, film and video, resin and textiles. To visit on November 11th 2018 was particularly memorable. To conclude a good walk in good company in such a way made it very special.